Hello, friends! I have been negligent in my posting, and I hope you will forgive me. A last minute trip to Key West, followed by a dickens of a cold (I just can’t get on a plane without catching something!) has been deterring my postings. This is all followed by the up-coming marriage of my niece Rebecca Sawyer to Andrew Queral. The entire family is attending and I am busy making preparations for that. So I am dedicating this weeks posting to Andrew and Rebecca. I wish you two the best of home, happiness, and family. So if you are expecting a wedding cake recipe, you are going to be very disappointed. I will also not be reminiscing about Southern Weddings. If you are looking for that, I highly recommend that you rent “Steel Magnolias”. Nobody has ever captured it better, or you could read the book that inspired the movie. 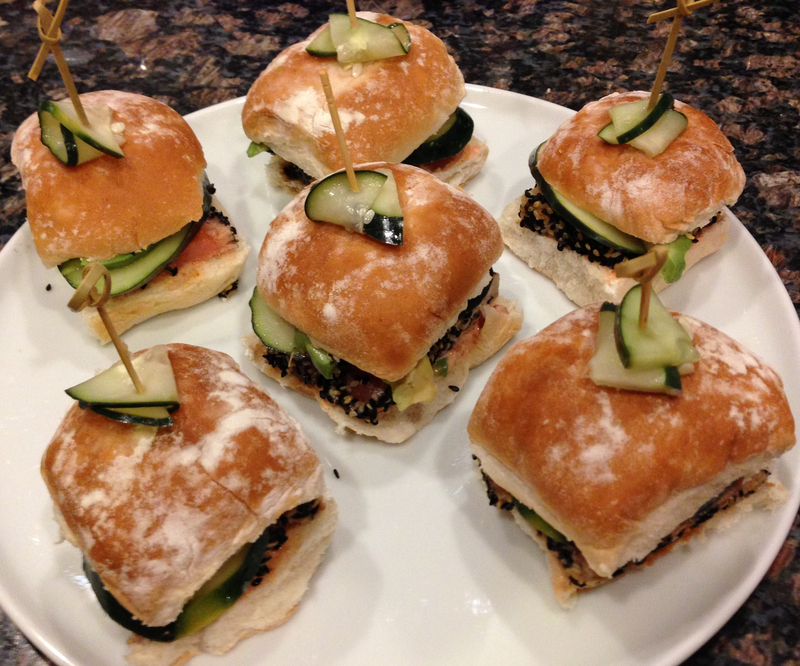 What I will be sharing with you today is a recipe for Ahi Tuna Sliders. Ok, it may seem like it is out of left field, but hang in there. First it is a marriage (wink wink) of a distinctively Asian flavor in a very American presentation. It also could be served at a wedding reception or any event where you need to prep things ahead of time and slap them together at the last minute. 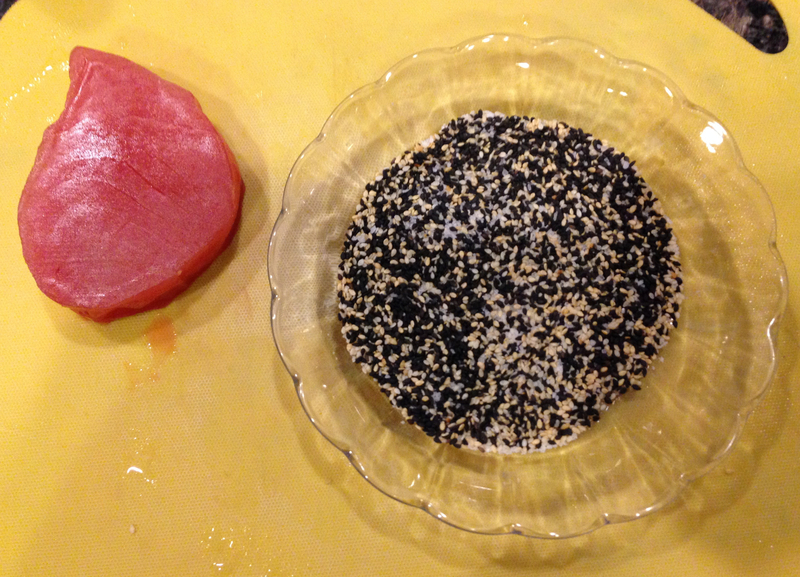 Combine Black and White sesame seeds with the Kosher salt in a shallow dish. Mix to an even distribution. 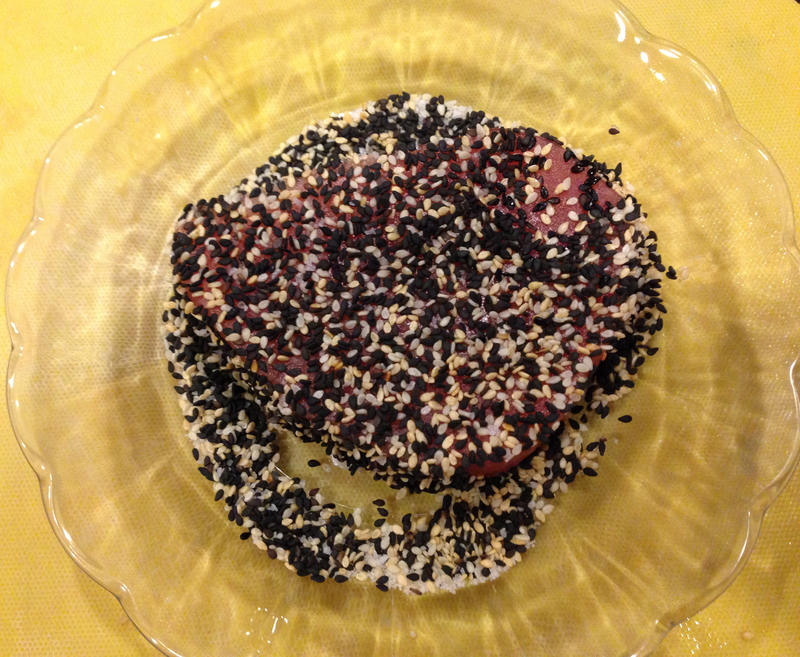 Place Ahi steak into sesame mixture and coat evenly on the flat sides, don’t do the edges. Place the coated Ahi on a thin sheet of aluminum foil. 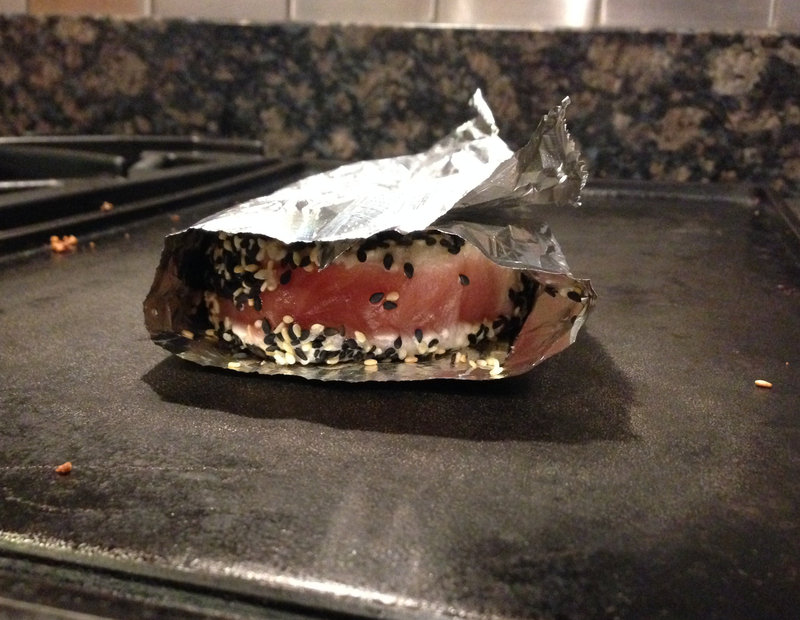 The foil should be just big enough to fold over the Ahi with very little lap. Do not seal. You need to be able to see the Ahi cook. Place the Ahi on your very hot griddle or heavy pan. When the side to the heat becomes slightly gray, flip the Ahi using a spatula. Be careful to keep the aluminum between the Ahi and the pan. When the other side barely starts to turn gray remove from heat and set aside. Let the Ahi cool. For easier slicing, return to fridge and chill. This can be done a day in advance. In a medium sized bowl, place Vinegar, Mirin, Salt, Canola Oil, Sesame Oil, and shallot. Wisk together. 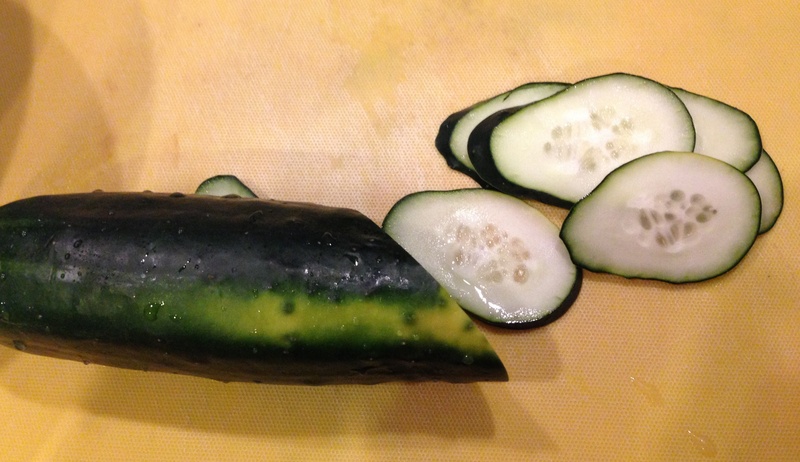 Slice the cucumber on the diagonal. Place Cucumber slices in the liquid and set aside for an hour. You can do this the day before if you refrigerate the pickles. 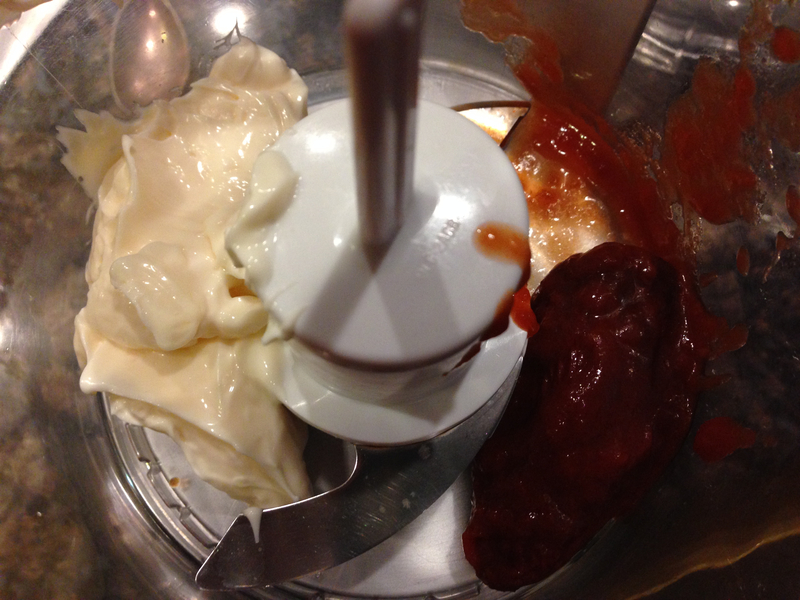 Place equal parts of Mayo and chipotles into a blender or small food processor, and blend. If you need to do this by hand, chop the chipotle and place into a bowl before you whisk. My family likes this mayo so I make a lot when I make it. You should only need 1-2 Tablespoons. Slice the chilled Ahi thinly. I usually get 6 sliders from one steak. I highly recommend slicing it chilled. I have never had any success slicing warm Tuna, but if you can do it, go for it! Slice your rolls if needed. Spread the Spicy Mayo on one side of the bread. I like to put it on the bottom. Place 1-2 slices of Ahi on the bread. Sprinkle soy sauce on Tuna. 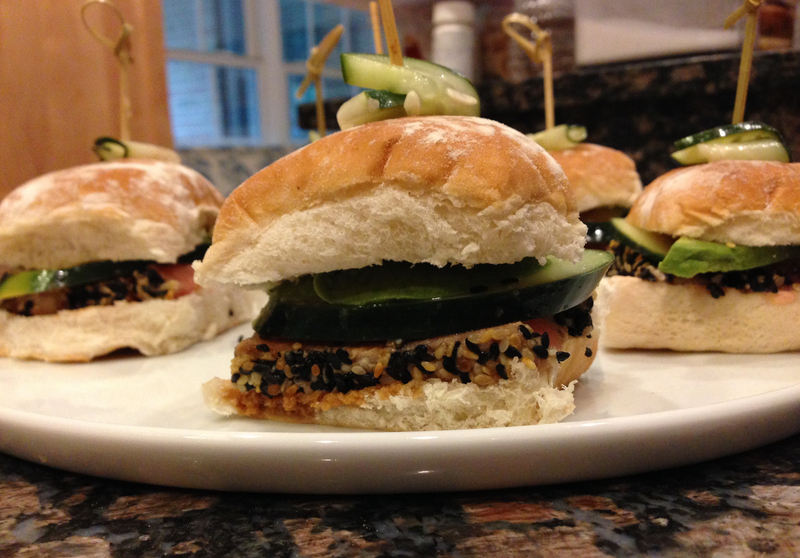 Top with a slice of the cucumber pickle. Add two thin slices of avocado and a thin slice of mango. Top with the other slice of bread. My husband likes Mayo on both sides of the bread, but I have found that that overwhelms the average palette. Secure with a Bamboo pick. Add a half slice of pickle of the top and then secure with the pick. Enjoy your delicious Asian-fusion treat! Aunt Patty, his looks amazing. Nobody can beat the goodies that you make! I am definitely going to try this, stay tuned! Made these last week and they’re already gone. Sweets don’t hang around long at my house.